Stone Brewing has teamed up with Bear Republic and Fat Head’s Brewing to create the next craft beer in their Collaboration Series lineup: TBA Extra Hoppy Brown Ale. Brewed with five types of malt and four types of hops along with brown sugar and molasses, TBA is sure to be a big mixture of nutty brown malt with a strong hop kick. In other words, absolutely delicious. Collaboration brews are gaining some serious popularity as of late, and what is typically a partnership between breweries has naturally evolved into one brewery’s inclusion of a renowned chef to help bring together new ingredients to form a unique Saison. 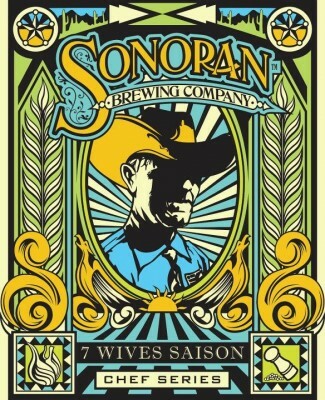 7 Wives Saison from Sonoran Brewing Company is the first beer in an exciting seasonal series that features local ingredients from Arizona and is brewed with the help and creativity of a distinguished chef. 7 Wives was brewed with input from Jeremy Pacheco, chef at Lon’s at the Hermosa, and includes wheat from Pacheco’s father’s Marana farm, fennel from his garden and McClendon’s Select Organic Farm in Peoria, mesquite syrup from Cotton Country Jams in Phoenix, and fresh pink peppercorns from Singh Farms in Scottsdale. Saison is a style that should lend itself well to these earthy and peppery additions, especially with an accomplished chef giving the final word on how it should taste. Look for the collaborated brew where Sonoran beer is sold (Arizona). Odell Brewing in Fort Collins, CO is giving us yet another great example of a collaboration brew with a unique twist. Odell Footprint Region Ale is a specialty ale brewed with one ingredient from each of the 10 states in Odell’s “distribution footprint”: hops and barley from Colorado and Idaho, wheat from Kansas and Wyoming, Arizona prickly pear, Minnesota wild rice, Nebraska corn, New Mexico green chilies, South Dakota honey and oak barrels from Missouri. Each ingredient was added by a guest brewer from their respective state. The result is a strong ale with prominent fruit and honey flavors and an ABV of 9.5%. Footprint will be available in 750ml cork and cage finish bottles throughout the brewery’s distribution area.